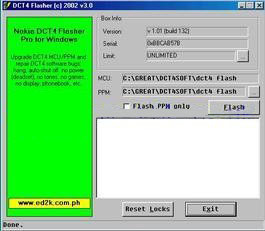 and 5.22 MCU flash files so that they can be used with the cheap DCT4 flasher! included with the fia folder!!! only one in the shot below). containg both the MCU and PPM files for an 8310 (version 5.80). process. Press the button on the software to select the PPM file. and the program will display a message box asking you to power off the phone. simply remove the USB power cable for a second and plug it back in. And thats it!! You have succesfully flashed your handset! color=#0000ff>Newer 8310/6510's and 6310i's Require Different Fia Files!!!!! 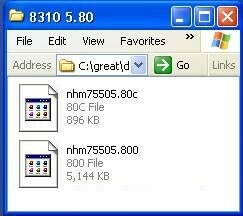 the existing fia folder (found in the same location as the flashing program DCT4v30.exe). 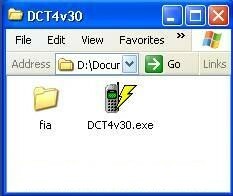 Run DCT4v30.exe again and hopefully you will succesfully flash your handset! have to do the same with your flash files also if they were copied from a CD. USER PORT (I will explain more about this when i get more time). uploaded userport, download it if you are using XP or 2K! I recommend using WinDCT4 instead of DCT4v30. Also when asked to power on the phone I found it better to plug the charger in and keep it in throughout the flashing process. The links above are currently broken as unlockme.co.uk has recently vanished?? ?